Just over a year ago, I moved all of our mailing lists at Venture Harbour from Aweber and Mailchimp over to GetResponse. Since that move, our delivery rates have increase, as have our open rates (by 48%) and click through rates. I’ve also experimented with many of GetResponse’s innovative features, such as ‘time travel’ and automation, which I’ll talk about in more detail below. In this post I want to share a few of the pros and cons of using GetResponse. While I do believe they are by far the best and most cost effective email marketing tool available, there are a few things about their service that are frustrating and are worth knowing before you become a customer. Pricing – Last year I wrote an in-depth comparison of the six major email marketing software companies. Of the six, GetResponse came out on top as the most affordable service at virtually all pricing tiers. If, for example, you have 5,000 subscribers, GetResponse will cost $45/month (whereas for the same list size, Aweber would cost $49/month, Mailchimp would cost $55/month, and Constant Contact would cost $75/month). On top of this, GetResponse have a free 30-day trial that doesn’t require a credit card. Powerful Auto-responders & automation rules – One of my favourite features about GetResponse is the ability to set up autoresponders in a calendar view. Unlike other services that show autoresponders in a list, this makes it easy to see what emails are being sent throughout a given month. On top of this, GetResponse have began adding automation features, that allow you to automate campaigns to be sent out when a subscriber clicks on a link, buys a product, or triggers a handful of other actions. While their automation offering is very limited in comparison to dedicated marketing automation tools like Ontraport, it’s an incredibly useful feature for the price (most automation tools cost $200-300/month alone). A/B testing – Another feature that GetResponse do very will is enabling you to run A/B tests on subject lines, content, delivery times, sender names, and list segments. 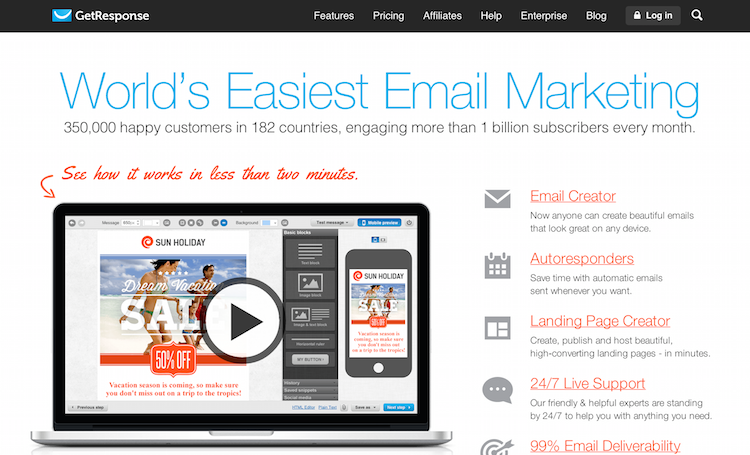 While most email marketing tools do enable A/B testing, most only allow you to split test the content and subject line. As I’ve written about before, email A/B testing is so powerful that when Barack Obama ran an A/B test on two subject lines, he found that one subject line generated $403,600 in donations, whereas the other variation generated $2,540,866. 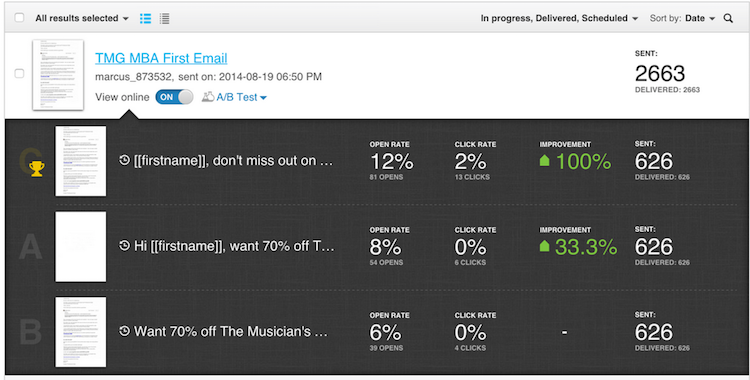 In short, if you’re not split testing your emails, you’re leaving money on the table. Responsive email design & inbox previews – While this feature is becoming common across most email tools, GetResponse have been slightly ahead of the curve in making mobile newsletter templates, and allowing you to preview your message across multiple mobile devices and email clients. Great reporting – While GetResponse’s at a glance reports aren’t anything too special, they make it easy to do side-by-side comparisons of campaigns, as well as letting you segment your campaigns to see which portions of your campaign worked better than others. On top of this, you can track the social media impact of your emails, and email ROI by installing a tracking code on your website to see which emails have the greatest impact on driving conversions. Deliverability – According to third-party deliverability review site, Return Path, GetResponse have a 99% email delivery rate. By nurturing relationships with ISPs and using automatic feedback loops to improve list hygiene, GetResponse have become one of the best email marketing services for achieving high deliverability rates. Time Travel – This is an extremely useful feature that enables you to set a specific time that your campaign arrives in the inbox of subscribers, regardless of their time zone. For example, if you set your campaign to go out at 9am, it’ll be sent to your subscribers in London and Tokyo at 9am their time. This is a huge time saver, as it prevents having to either segment your list into lots of different country buckets, or having to send out your message to a portion of your audience at sub-optimal times. Email builder is clunky – One of my biggest gripes with GetResponse is the clunkiness of their drag and drop email builder. While there’s no specific issue, the interface is generally unintuitive and I often struggle to do simple things that shouldn’t require any though, such as correctly aligning content sections, and inserting images. Hard to segment list by location – One feature that I love about Mailchimp is the ability to automatically collect a subscriber’s location based on their IP address and then segment email campaigns to specific users based on that criteria. While GetResponse do collect IP information, I’ve never figured out how to segment an email campaign based on location without having to explicitly ask the subscriber to enter their location in an email capture form. Automation is limited – While GetResponse’s automation features are very powerful for the price, they’re quite limited in terms of functionality. Currently there are only about seven rules that you can use to automate actions. On top of this, their automation rules only allow you to automate adding or removing a subscriber from a specific list. I imagine this list of rules will expand as GetResponse develop this aspect of the product over time. Unintuitive user interface – GetResponse’s UI design ranges from slightly unusual to outright hard to use. From using non-standard labels like ‘statistics’ instead of ‘reporting / analytics’ and ‘messages’ instead of ‘newsletters / campaigns’, to having about three different menus, getting used to GetResponse can take a bit of time. Having used other popular email marketing tools, GetResponse is by far my favourite, even despite having a few features that aren’t as ironed-out as I’d like. When you take cost into account, GetResponse is also one of the most affordable services. If you’re not too sure, you can take GetResponse for a test drive with their free 30-day trial here. Thanks for this review Marcus – I’m so glad someone else shares my view that although Get Response’s product is in essence very good, the UI of their builder is terrible, as is the UI of their dashboard in general. I have wasted countless hours trying to figure things out, and lost newsletters I’d created due to the ridiculously complicated/unintuitive set up. Thankfully their support is first class (Live Chat is very fast), but still I think their product needs a lot of work.